MUNICH — It would be a novelty to hear Le vin herbé the way composer Frank Martin conceived it. The 1940 secular chamber oratorio reportedly soars when realized in concert by twelve French-singing voices, double string trio, double bass and piano — its lean forces yet complex harmony producing intriguing shafts of color; its drama predicated on shuffling the voices, used one-to-a-part and as a chorus. But a listener could wait decades for the chance. When Martin’s 100-minute Tristan et Iseut saga shows up at all, it has either morphed into an opera (Katie Mitchell’s realist concept for Berlin as example) or, more often, been puffed up for standard choral forces. 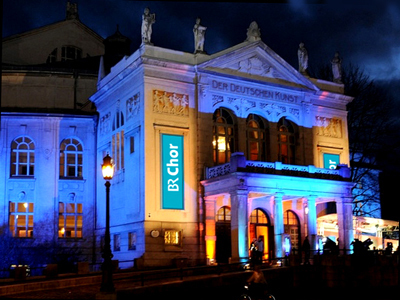 This was its fate in a Bayerischer Rundfunk outing Jan. 23 here at the Prinz-Regenten-Theater, a missed opportunity given the broadcaster’s resources and artistic umbrella. BR Chor artistic leader Peter Dijkstra kept Martin’s instrumentation but fielded 38 singers, blocking entry to the planned sound world and permitting only sporadic drama. Martin’s varied commentaries took on a sameness, so that for instance no urgency accompanied the waking of Gorvenal and the “last night-flight through the beloved woods.” Still, tenor Marcel Reijans’ keen and heroic Tristan injected vitality, and with good French. In support: soprano Johanna Winkel’s sensitive Iseut, soprano Barbara Fleckenstein’s clearly worried Branghien, and the unruffled, oaky Marc of baritone Andreas Burkhart. Refined choral contributions only emphasized what was amiss texturally, despite peppy punctuation from members of the Symphonie-Orchester des Bayerischen Rundfunks, and Dijkstra’s conducting brought out the intriguing harmonies at reverential speeds. This project should have benefitted from the intervention of Mariss Jansons in his supposed joint capacity as chief conductor of the BR Chor and the BRSO, to ensure forces were cast in line with Martin’s wishes and to properly serve the broadcaster’s listeners. The charismatic Dutchman, meanwhile, is closing out his 11-year BR Chor tenure. He has not been the most imaginative musician in Romantic and Modern works, but Bach he conducts naturally and lyrically. His St Matthew Passion three years ago deserved its plaudits, and his St John Passion, with the mellifluous Kuwaiti bass Tareq Nazmi as Jesus, has just appeared in a neatly documented BR Klassik CD set. Dijkstra’s farewell actually comes soon, with the B-Minor Mass here and in Baden-Baden, Nuremberg and Ingolstadt. Replacing him in September will be British conductor Howard Arman, while Jansons remains chief conductor, for what that is worth. As for Le vin herbé, Victor Desarzens’ 1961 recording with Eric Tappy as Tristan and Frank Martin at the piano (on the Westminster label) provides an authentic path through the score. This entry was posted on Friday, March 18th, 2016 at 10:51 am	and is filed under Munich Times. You can follow any responses to this entry through the RSS 2.0 feed. Both comments and pings are currently closed.